I was looking at an article in The Week Magazine, where they are talking about the epidemic of loneliness. 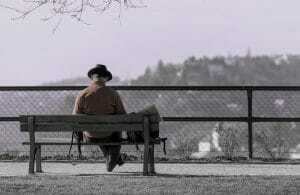 The article says that nearly half of all Americans today say they are lonely. Researchers define loneliness as the emotional state created when people have fewer social contacts and meaningful relationships than they would like — relationships that make them feel known and understood. The article goes on to state that isolation is more common. The average American’s social network shrank by more than a third, which is defined by the number of close confidants. One reason for this is the aging of the Baby Boomers — our Gracefully Greying generation. Baby Boomers have had fewer children and more divorces than their parents. This has left many without companions in their old age. About 1 in 11 Americans age 50 or older does not have a spouse, romantic partner, or living child. That is approximately 8 million people. One in six Boomers lives alone. The fact that work is increasingly transient is also making people lonely. Americans are leaving family and hometowns behind in search of paychecks. The articles states that young people are most at risk of being lonely in modern society. Generation Z members (ages 18 to 22) and Millennials (ages 23 to 37) scored the highest for loneliness. This means that as we are gracefully greying, we should not do it alone. If we don’t have family who we are close with we should seek out friends and companions. These are some of the thoughts of this article that I want to share with you. If you have any comments please post them. Henry Gornbein is a partner with the full service law firm of Lippitt O’Keefe Gornbein, PLLC in Birmingham, Michigan. He is a specialist in all areas of family law and is a certified family law mediator. Henry is the creator and host of the award-winning Cable Television series, “Practical Law” and creator and host of “Gracefully Greying,” a weekly video podcast on New Radio Media. He is the author of the book, “Divorce Demystified, Everything You Need To Know Before You File For Divorce” and is currently co-writing with Jack Haynes, PhD, the book “Child Custody Demystified, The Ultimate Guide To The Custody Of Your Children.” He is a frequent blogger and lecturer on all aspects of family law as well as issues involving the impact of social media and what is legal in the digital world in divorce. He is a former chairperson of the Family Law Section of the State Bar of Michigan, a former president of the Michigan Chapter of the American Academy of Matrimonial Lawyers and winner of the Professionalism Award from the Oakland County Bar Association. Advertising and sponsorship opportunities are available. Contact info@NewRadioMedia.com for details. Gracefully Greying explores aging issues that are as inevitable as death and taxes. If you are over 50 – or have parents over 50 – this show is for you! We’ll help you navigate the many challenges of aging. Each show will focus on a single topic, such as, financial issues, legal issues, medical issues and psychological issues, with a guest who is an expert in that field. class="post-template-default single single-post postid-13380 single-format-standard samba_theme samba_left_nav samba_left_align samba_responsive wpb-js-composer js-comp-ver-5.7 vc_responsive"